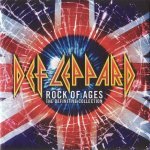 Def Leppard played a show on the Rock Of Ages tour in Schaumburg, IL on 30th July 2005 and a fan review was sent in by Marlo. The show took place at Alexian Field. Three other fan reviews are available from this show. "Then it was time for the Leps to take the stage! They launch into Action and the thrill ride has begun! All I can say is they were amazing live! I really did forget just how amazing they are. The set list seemed to be the same as all their other shows. I was very happy to hear Rock on and Promises."